I have been tagged by Melissa from Writing with Style with The Lucky 7 Meme. Meme: an idea, behavior or style that spreads from person to person within a culture. 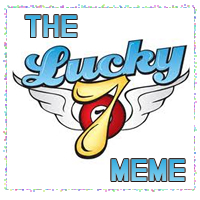 The Lucky 7 Meme is a fun game between blogging authors, where the one tagged uses specific guidelines (see below) to select a tiny portion of his/her WIP (aka: work-in-progress) to share with their readers. Afterward, seven more bloggers are linked in a post to carry the torch forward. ... Below her on the jetty, Wills directed several stevedores in the unloading of his precious stoats. His cap, pulled low over his eyes, and the set to his shoulders told her how hard he found giving up his companions. The return trip to England would be a long and lonely one for Wills. If I haven't tagged you, feel free to join in anyway! I'm going to cheat a little. :) I was tagged for this meme a month ago, so I'll just share the link to the excerpt I already posted! Somehow I missed yours, so I'll pop over now and read it. I enjoyed your seven lines, Sue. It says a lot and I want to know more! Thank you for sharing. Thanks for tagging me! I hope that's the Clarissa you're referring to. Anyways, I'll try to get it on a future blog post. Yes, Melissa, it's set in the 1880s in New Zealand. Your pirate story sounds great. ah... just found this post. How does it work? Do I write my 7 here or on my blog? You write it on your blog. :) just cut and paste from my blog and add your 7 lines.